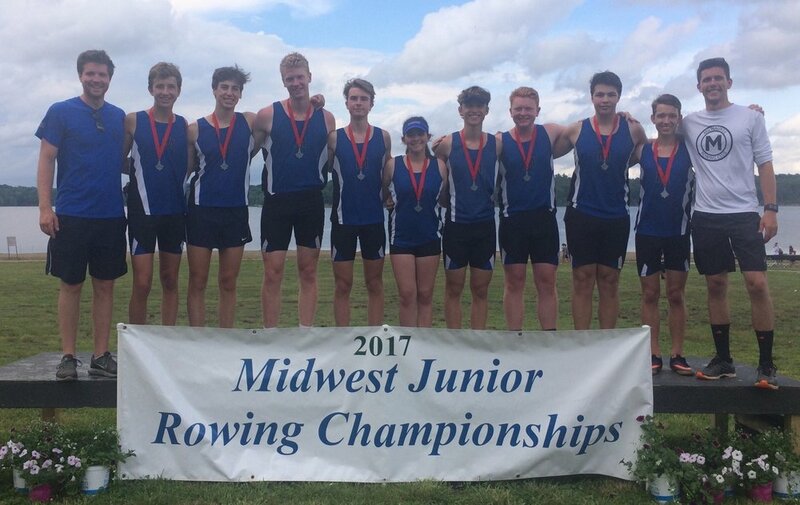 The Milwaukee Rowing Club Juniors had a strong performance at the Midwest Junior Rowing Championships. Out of the nineteen events in which the juniors program was entered, MRC had fifteen boats compete in the grand finals. These juniors had many courageous performances throughout the weekend, highlighted by earning the most medals at Midwest Junior Championships in MRC history. The boys team captured the first medal for MRC, earning third place in the 3rd Varsity 8+ on Saturday. The boys team was also successful on Sunday earning a silver medal in the 1st Novice 8+ and placing bronze in the 2nd Novice 4+. The girls team finished the regatta with a bang, capturing gold in both the 1st Novice 8+ and the 2nd Novice 4+. The Boys 3rd Varsity Eight earned the first medal of the weekend for MRC on Saturday afternoon. The MRC boys finished with a time of 7:05.4 to solidify their position over fourth place Chicago (7:27.3). 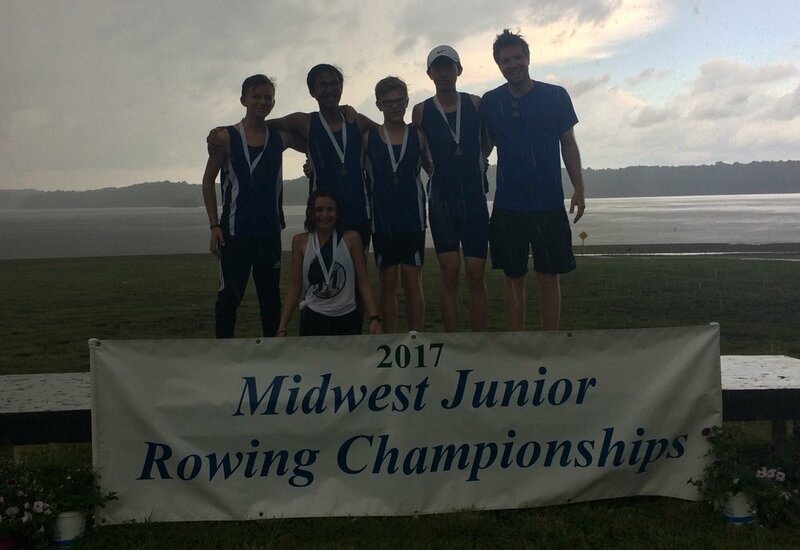 This is the third year in a row in which the MRC Boys 3rd Varsity Eight has earned a medal at the Midwest Junior Rowing Championships. Girls 1st Novice Eight - Midwest Champions! The Girls 1st Novice Eight showed their strength and determination in the grand final. They were in control of the race from the beginning and continued to push away from their competition. The MRC girls finished with a time of 7:06.1 ahead of 2nd place Cincinnati (7:14.3) and 3rd place Chicago (7:14.4). This is the first time MRC has captured gold in the event. The Boys 1st Novice Eight was successful in their hunt for medal position. They had a great race finishing behind first place Cincinnati (6:26.4) with a time of 6:39.9. Their performance earned them a silver medal, ahead of third place Detroit (6:45.2). Girls 2nd Novice Four - Midwest Champions! The Girls 2nd Novice Four was the last race of the day for the novice girls team. Similar to the 1st Novice Eight, this crew had a good position early in the race and continued to stretch their lead. They were able to take the race by a comfortable margin with a time of 7:59.3 ahead of Dayton (8:17.5) and Cincinnati (8:18.7). The MRC 'B' boat in this event was also able to qualify for the final with a solid race in the heats. The 'B' boat had a strong showing in the final placing sixth (8:27.6) out of the seven crews. The grand final for the Boys 2nd Novice Four was the last event of the regatta. The race took place just before a storm made its way over Harsha Lake. The MRC crew had a really strong race holding medal position in the early moments. They were able to solidify a bronze medal finish through the line with a time of 7:54.6 behind St Louis (7:48.5) and Cincinnati (7:38.7). 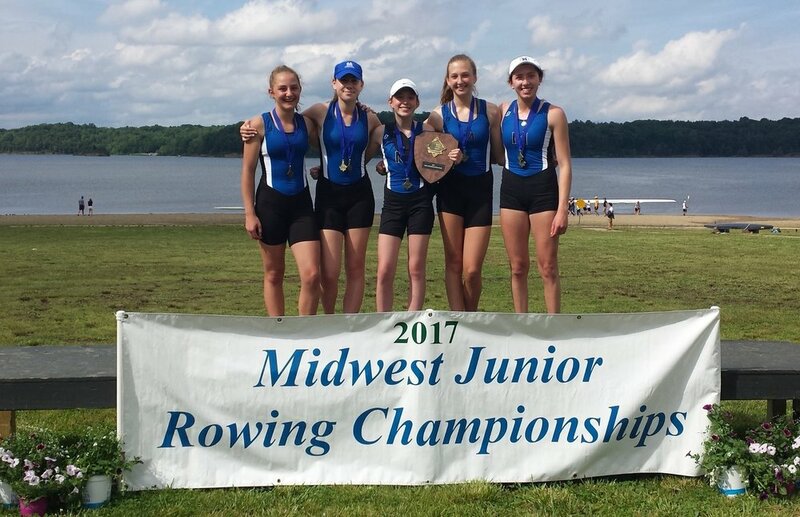 The Milwaukee Rowing Club Juniors had a strong performance at the Midwest Junior Rowing Championships. Out of the twenty events in which the juniors program was entered, MRC had thirteen boats qualify for the finals. These juniors earned the most medals at Midwest in MRC history. The boys team had a successful day, earning first place in the 2nd Novice 4+ and placing third in both the 1st Novice 8+ and the 3rd Varsity 8+. The girls team took the bronze medal in the 1st Varsity 4+ event, qualifying them for the Youth National Championships. Boys 2nd Novice Four - Midwest Champions! The Boys 2nd Novice Four had an exciting race pushing ahead of the field to win the title. MRC finished with a time of 7:15.08 before St Louis (7:16.26) and Upper Arlington (7:20.02). This is the second year in a row in which a second novice boys boat has won gold at the Midwest Junior Rowing Championships. The Boys 1st Novice Eight showed toughness in their grand final when they established the third position behind St Louis and Cincinnati. The boys finished with a time of 6:41.54 a comfortable margin ahead of Upper Arlington (6:45.96). The Boys 3rd Varsity Eight was successful in there hunt for medal position. They finished behind Cincinnati and St Louis with a time of 6:52.10. This earned them a bronze medal, well ahead of 4th place Westerville (6:58.10). The Girls 1st Varsity Four was the last race of the day for the girls team. They had a good position early in the race. As they approached the finish line, they were in a heated battle for 3rd against Dublin Crew. The MRC girls were able to edge it out and finish with a time of 7:34.23 just ahead of Dublin (7:34.88). They finished behind Cincinnati and Twin Cities. Being a 1st Varsity event, the bronze medal earned them a bid to the USRowing Youth National Championships where they will compete against the best in the country in Sarasota-Bradenton, FL (June 12-14). The MRC Juniors will compete at the Greater Chicago Junior Rowing Championships, held this Saturday in Crystal Lake, IL. Milwaukee will be up against some of the best teams from Chicago and surrounding areas. Saturday's field will include Camp Randall, New Trier, Loyola Academy, St. Ignatius, and several other teams. Families are encouraged to come support the team. Please refer to the race website for more information. The regatta will take place at Main Beach. There is not an address for the Main Beach building, however you can click here to see where the venue is located. Note: Dogs are not allowed. The 1850 meter course is six lanes wide with buoys on the outside of lanes 1 and 6. Buoys will be at the first 100 meters and every 250 meters, as well as the starting and finishing lines. Rowing will be from west to east, finishing in front of the Main Beach Building. Bring binoculars to better see races as they come down the course. Races essentially come straight towards the viewing area. The racing schedule has yet to be posted. The coxswains meeting is set for 8:00 AM. All athletes will be expected to arrive early Saturday morning to unload the trailer and prepare our equipment for racing. Lineups along with the final itinerary coming soon! The MRC Juniors had a successful day of racing on Lake Mendota on Sunday. With stormy conditions projected, it turned out to be warm and sunny. All crews battled against a quartering headwind in dual races against Camp Randall. Congrats to all athletes on a very competitive day. Before elaborating on some of the results, we would like to thank all parents for remaining flexible with the schedule and location. We really appreciate your patience throughout planning and Sunday's racing. We also want to take a moment to recognize the parent volunteers who were fantastic this weekend. Your help is greatly appreciated by our staff! The day began with the Varsity 4's. The Boy's 4 had a good start handling the conditions well. Milwaukee was behind early, but they handled the windy conditions well. Camp Randall was able to take the race by open water. The Girl's 4 had a similar start, clean and handling the conditions well. Camp Randall was able to edge in front early in the race. With MRC battling all the way down the course, Camp Randall won by a small margin of open water at the finish. The Boy's Novice 8 had a strong start pushing ahead from the beginning of the race. They continued to add to their lead as they handled the conditions and ended up winning the race handily. The Girl's Novice 8 had a very close race all the way down the course. With a constant battle back and forth throughout, they looked strong in their push to the finish and fell just short by about 3/4 of a length. The Boy's 2nd Varsity 8 had a strong start, but lost a little momentum when they were pushed off the course slightly by the other crews. The boys had a good early season piece showing some good base speed. They were down about a length at half way and two lengths at the finish. The Girl's 2nd Varsity 8 showed great strength from the first stroke of the race. They were up by open water in the first 500m and continued to stretch their margin throughout the race. The girls pushed to the finish line about forty-five seconds ahead of their opponent. The Varsity 8's began the second flight of racing. The Boys Varsity 8 looked sharp on their start and were able to push to a bow to stern lead in the first 500m. The boys pushed their lead through the middle of the race and held off a strong Camp Randall sprint to win by 3/4 of a length. The Girls Varsity 8 had a similar start to the boys, pushing to a length of open water ahead by the 1000m mark. They held this margin through to the sprint where they pushed for slightly more winning by about eight seconds. The final event of the day proved to be exciting from the 2nd Novice 8's. The Boy's 2nd Novice 8 had tight competition off the start and through the first 500m. At the half way mark they were down by two or three seats but held strong. With solid coxing and a good final push they were able to edge ahead to the finish line. The Girls 2nd Novice 8 had a good start and edged slightly ahead early in the race. The girls were able to keep a consistent rhythm and continued to open their margin throughout the race. They finished the race winning by a little more than 10 seconds to end the day. For reference, here are the lineups from Sundays racing. The next race for the MRC Juniors is the Greater Chicago Junior Rowing Championships on Saturday, May 2. More info coming soon.